Every blog worth their salt has a homemade hummus recipe on it, but until now this one hasn’t had one. Time to change that! I’m going to admit something to you, and it isn’t pretty. Up until now I rolled my eyes when I saw a hummus recipe on someone else’s food blog. It just seemed so overdone. Why add yet ANOTHER hummus recipe to the million and one already on the Internet? Well, apologies to all those blog owners I’ve rolled my eyes at. You were right all along! 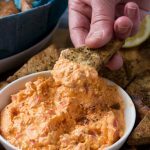 Because hummus is an incredibly delicious not-to-mention nutritious snack, and as this blog is part ‘recipe book’ for myself to use over the years, I’ve decided that I do in fact need to have a hummus recipe here! 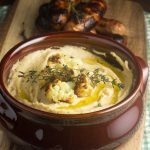 Hummus recipe, where have you been all my (blogging) life? Also, I’ve been experimenting with hummus recipes for years, and have now finally decided on the ‘perfect’ way to eat it. I don’t like my hummus to be too thick, or too garlicky, I like to use a good tasting olive oil in it, and I like to be able to taste the lemon. I also like to add an extra drizzle of olive oil and a generous sprinkling of toasted pine nuts on top, which is the way I’ve often eaten hummus when ordering it in restaurants. 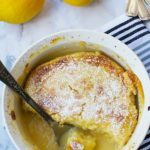 So I thought it would be nice to share with you the recipe I prefer – hopefully you enjoy it this way too! The great thing about hummus (apart from the deliciousness and nutritiousness!) is that it can be whizzed up in a food processor in little more than seconds. Which means it well and truly belongs on this here little humble blog! To justify my hummus recipe’s place here even more I thought I’d add a recipe for really (really really) simple flatbread. 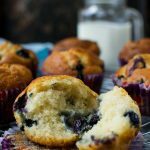 I LOVE this recipe as it’s made with only two main ingredients – self raising flour and yogurt. No yeast required. The flatbread is also really easy to cook. Just roll out a ball of dough then cook for just a minute or two on each side in a hot, dry griddle pan. Then drizzle with a little olive oil and sprinkle with salt while still hot. It’s good… so unbelievably fresh and delicious. 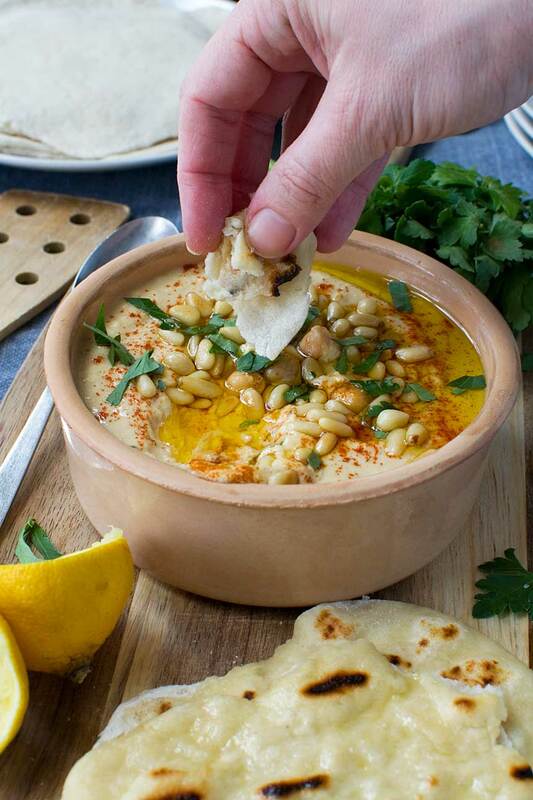 Mop up that beautifully easy hummus dip with your warm homemade bread and you’ll be in food heaven. 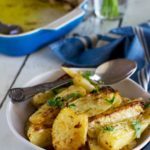 You may even want to serve this together with a big piece of the spinach and feta filo pie from last week’s post – for a mini Mediterranean feast! *Update: a reader has rightly pointed out that there are actually more than 2 ingredients in the flatbread. Well, true, I can’t deny it, there is also a tiny bit of baking powder in there too. But I decided to ‘cheat’ slightly and stick to the 2 main ingredients in the title – flour and yogurt. The olive oil and salt toppings are purely optional – but I would advise adding this final touch. Mmmmm! 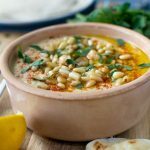 Every blog should have a hummus recipe, so here's mine! (better late than never!) I love this quick version. 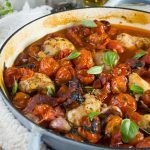 Just throw a few ingredients into a food processor, then tip into a dish and top with pine nuts and a sprinkle of paprika. 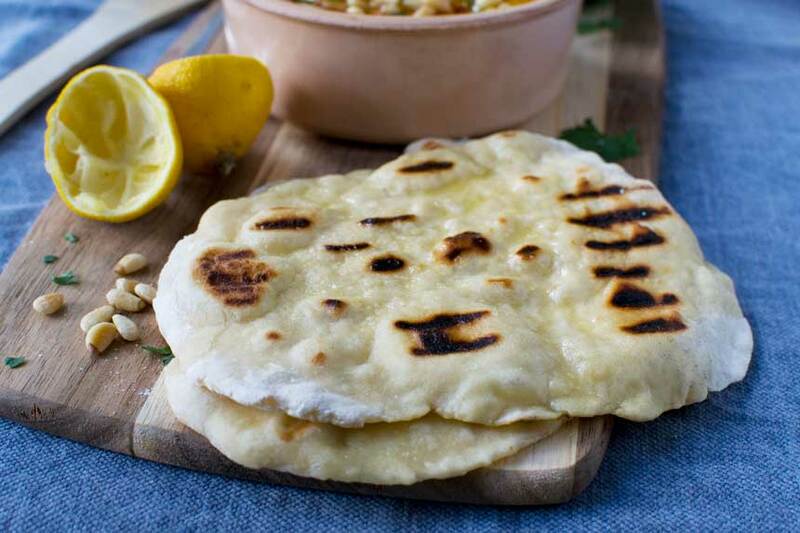 Serve with some simple 2-ingredient flatbread and you're in appetizer heaven! 1 1/3 cups plain or Greek yogurt I used Greek of course! Put the first six hummus ingredients (from the chickpeas to the olive oil) in a food processor together with three tablespoons of the reserved chickpea water. Blitz until smooth. 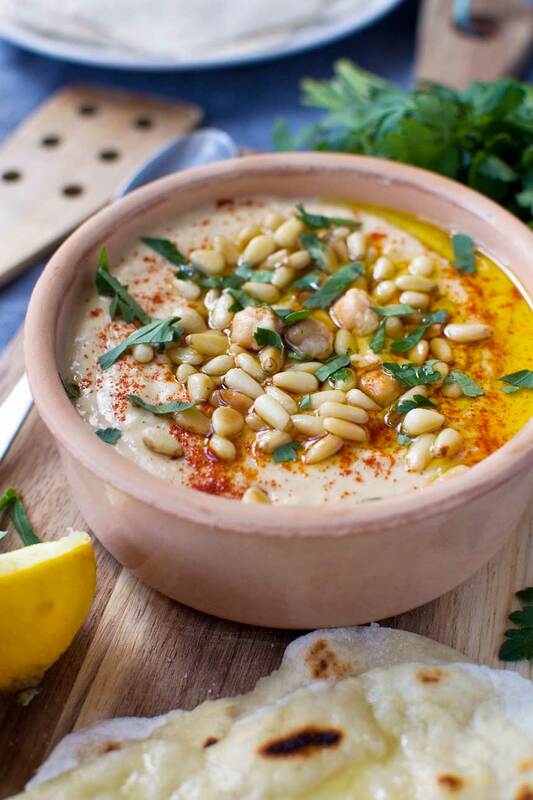 Tip the hummus into a bowl, drizzle with a little olive oil and scatter with the toasted pine nuts (if using). Sprinkle with a little paprika (if using). Combine the flour, baking powder and yogurt in a large bowl and mix until a dough begins to form. Tip the dough out onto a floured board or clean work surface and knead a few times until you have a smooth ball of dough (if the dough seems a bit too dry add a tablespoon or two of water to help bring it together). Divide the dough in half, then divide each half into four to give you eight equal pieces of dough. Form each piece into a ball, then roll out to a few millimetres thick. Heat a griddle pan until quite hot, then cook each of the rolled out pieces of dough for a minute or two on each side (they should puff up a bit when you’re cooking the second side). Drizzle with olive oil and sprinkle with salt while still hot. 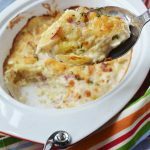 Serve with the hummus and a piece of spinach and feta filo pie (if you like!). Hi Janette – so happy you approve! I think the toppings and bread make all the difference! 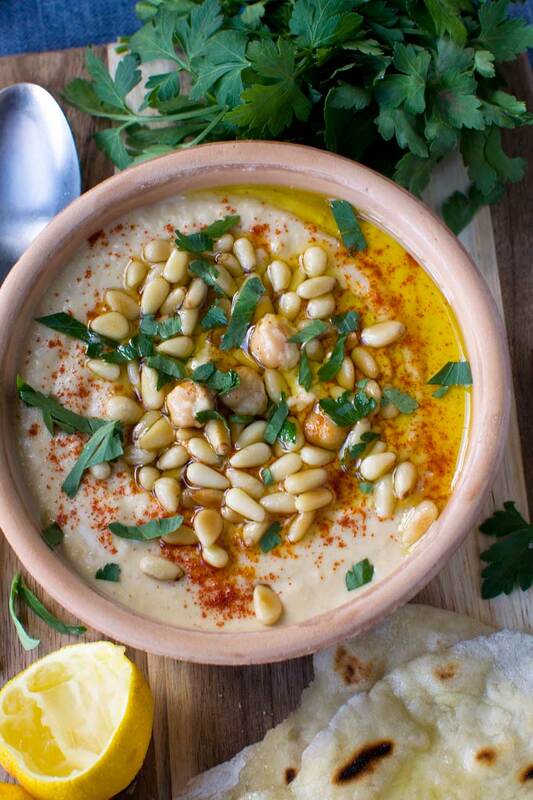 Hummus is a go-to for us. Love the idea of the home baked flatbread. 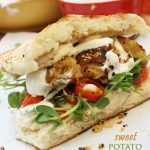 A question about the Greek yogurt – I have only fat-free, 0% Fage on hand – do I need a yogurt with some fat in it to try this flatbread? 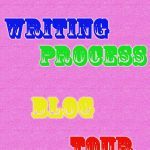 Thanks – love your blog. Hello! Yes, by all means try this with the 0% yogurt. In fact, I do believe that’s what I used myself so you’re good to go. To be honest you could even use water. The yogurt just adds a nice mild acidity, and of course a bit of extra protein and calcium! Thank you so much for the question and I really hope you enjoy this! Hmm… I’m a little confusedabout this 2 ingredient flatbread. Looking over the recipe, it seems like there are more than double that. They look alright and I’ll save the recipe for future reference, thanks. Hi Catherine. LOL… you got me!! I should have known I wouldn’t get away with this on the interwebs! I figured there are only 2 main ingredients in this – just flour and yogurt. The olive oil and salt are very much optional added extras. I’ll add a note in the recipe to explain my ‘cheating’! I know, honey! I get inspiration from you ALL the time – we definitely like the same kind of food. You want to know how we’re doing? This motherhood thing is HARD x 1000 and the only way I’m getting ANYTHING done for the blog is by taking the boy to a cafe and tapping away at about a million miles a minute until he stirs… lol! Which is usually not very long! Hey, that’s what JK Rowling did and look where she is now!! Keep on keeping on. I LOVE hummus!! It’s one of those super versatile and satisfying foods. And I can tell that you’ve tried enough varieties to create a strong sense of your favorite, so I must try it! My guy is allergic to chickpeas (bummer! ), so I’ll be making this with white beans. Bonus flatbread recipe too. So simple and looks delicious. Hi Marissa – oh what a pain to be allergic to chickpeas. That’s unfortunate, but I guess that’s the great thing about hummus. You can make so many delicious varieties! So I followed this recipe however based on your comments, I used 1/2 water and 1/2 yogurt – in hindsight what happened was pretty obvious – my dough was more like batter. 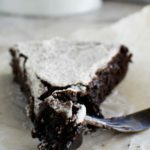 I added plenty of flour and lost some dough to extreme stickiness, but otherwise this recipe worked out great! The flat bread was ridiculously good considering what went into it! I added 1 tsp of baking powder + 1/4 tsp salt to the flour before adding the other ingredients because I didn’t use self raising flour. Still worked out great! Thanks for this super simple recipe! Still, I’m very happy the bread still turned out great. It’s reassuring to know this is pretty much a failsafe recipe. Thanks so much for your honest feedback, Ren! Hi Linda! I haven’t tried freezing them but I think it would work well. I’d separate the dough into balls, then freeze them wrapped in baking paper and aluminium foil (or a small freezer bag). Then defrost and roll as you would when fresh. Good luck!